Conclusion: about 10% of DOAJ journals have impact factors, and about 10% of impact factor journals are DOAJ journals. Open access journals (or some OA journals) using the APC business model may be exploiting impact factor status as a means to raise prices. Further investigation warranted. As of May 3, 2015, Thomson Reuters’ Journal Citation Reports (JCR) listed 11,619 journals with impact factor (IF). Of these, 1,146 are listed in the Directory of Open Access Journals (DOAJ). 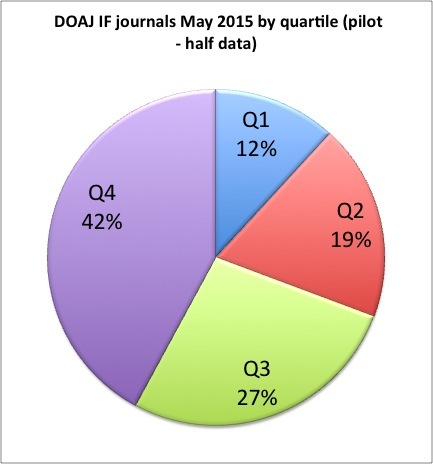 As of May 15, 2015, 10,532 journals were listed in DOAJ. This means that 9.8% of the titles listed in JCR are DOAJ titles, and 10.8% of DOAJ journals have an IF. The pilot involved selecting half of the DOAJ journals with an IF (572 journals from both sciences and social sciences, selected alphabetically abbreviated title A – J Otolaryngol-Head and looking up the quartile and subject ranking. Of these titles, 169 were included in the May 2014 OA APC sample. For 126 journals data was available for both December 2013 and May 2014, the basis of the 2013-2014 calculations. Assuming that the portion of APC-charging journals would be the same for non-sampled journals, this would result in an estimate of 229 journals with IF and APC, 40% of the total. This is higher than the 26% of journals with APCs as of May 2014. 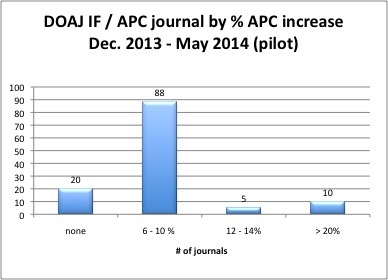 We have 110 journals with APC information collected in 2010 S&B,Dec 2013 SKC and May 2014 SKC. 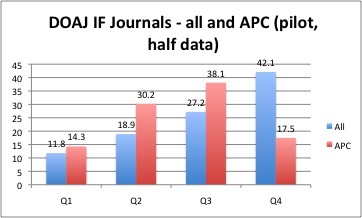 3,2% of the journals decreased their APC (this is 3 journals; 2 are Hindawi journals. Hindawi as of May 2014 had a practice of rotating free publication. These 2 journals had APCs of 0 in 2014, but have substantial prices today (Bioinorganic Chemistry Applications is now $1,250 and International Journal of Genomics is now $1,500). The third journal with an apparent small price decrease, Experimental Animals, from $200 to $198 USD is likely an anomaly due to a weakening of the main currency, the Japanese Yen, with respect to the USD. In other words, all price decreases appear to be temporary anomalies. The following figure reflects the 123 titles remaining after removing the 2 anomalous 0 APC titles. 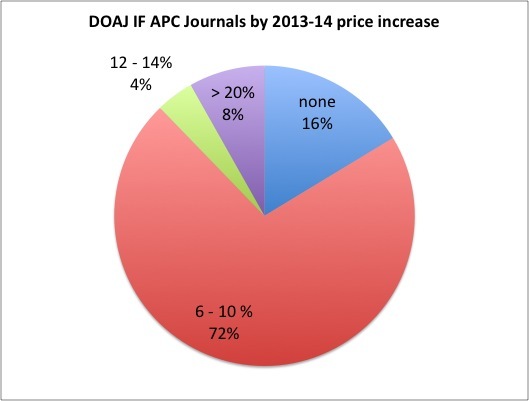 The following chart illustrates the percentage of journals by price increase from 2013 to 2014.